Researching relationships between structure and form. The installation designed by Mark Fornes and his firm for the World Expo 2017 in Astana was called "Minima Maxima". The work is a lightweight, ultra-thin self-supported shell structure conceived both to explore the relationship between structure and form and to offer visitors an engaging space. The installation is part of the wider research the firm conducted on the application of codes and computer protocols in design and fabrication. The installation involved a challenge: to reach maximum curvature in the minimum available volume. The work appears as a giant 3D puzzle in space where each piece plays a part in the structure's stability. While single pieces are linear, the final shape is curved instead, and the shell is just six millimetres thin. In this video, Fornes' voice guides the observer to discover the work by unveiling its conceptual approach and as well as details of its fabrication. The short film follows the entire process, from the initial idea up to the final design and construction process, and then offers an overview of computational design and material research, finally showing the use of the space. The images switch between digital and reality clearly showing the correspondence to observers. 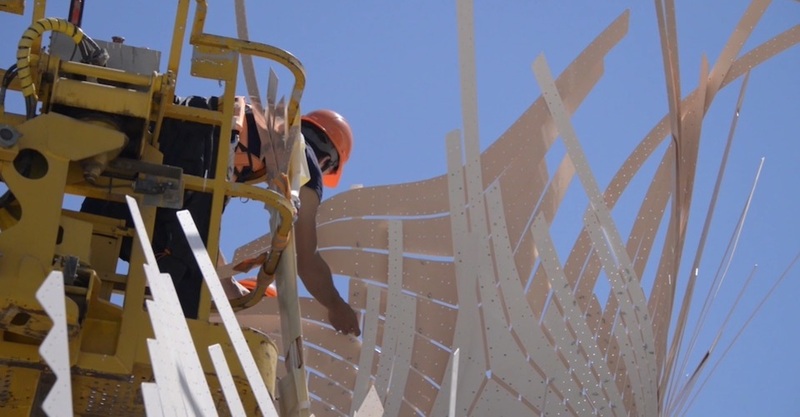 With this project, Marc Fornes experiments on a theme that crops up in all his works, namely parametrical design applied to an ultra-thin structure. The architect is nonetheless interested in creating a space visitors can interact with. Along with challenging the relationship between structure, form and material resistance, a significant aim was also to create a functional object with a porous enclosure that could engage visitors and provide them with a moment of contemplation amid the busy grounds of the World Expo.